Forced to name a fish that I thought the most hardy, indestructible catfish I have encountered, then this month's featured cat would be it. They are incredibly adaptable and resilient in conditions in which virtually all other fish would perish. There are two intermingled reasons for this hardiness. The first is that this fish can breathe air - literally. Notice its relatively underdeveloped gills? Well, this is because the fish has evolved a method of utilizing air "breathed" from the surface. In fact, so ineffective are its gills that many report these fish will soon die if unable to reach the water surface of the aquarium. The second reason provides the fish with its common name. Should water conditions get really bad then it leaves! Walking catfish can leave water behind and go on a cross-country expedition! Providing the land is relatively damp and the fish doesn't dry out these catfish can roam the land searching for better places to swim. During these excursions the fishes gills clamp shut both to protect their delicate membranes from drying out and to minimize water loss. Additional pores produce mucus around the body of the fish which also aids in the battle to stay wet. Needless to say this fascinating behavior is all very good in the wild, but make sure you have a tight fitting lid on your aquarium. These fish are real escape artists and if you don't take precautions, they are likely to leave your living room aquarium and go walk-about carpet-side. This fish is also found as an "illegal alien" in a number of places where it shouldn't be. Florida and Hawaii are two good examples. Because of the fishes fairly large size and certainly its enormous appetite and growth rate, they can become unwanted pets very quickly. In error many, usually inexperienced, aquarists feel that the "best thing to do" is to release this fish into the wild. This is a terrible mistake. Harsh as it may seem, given no other feasible course of action, unwanted tropical fish should always be humanely destroyed. Unleashed, these "aliens" are capable of wiping out entire populations of local fish who have never seen a predator the likes of the walking catfish. The risk of and damage caused by such introductions has driven many governments to ban the import of these fish. This sadly necessary action deprives many responsible aquarists of keeping fish that are both interesting and rewarding. The picture above shows the mottled or marbled colour variety. More commonly available is an all pinky/white form. From time to time you also see the "orginal" brown with white belly wild form. 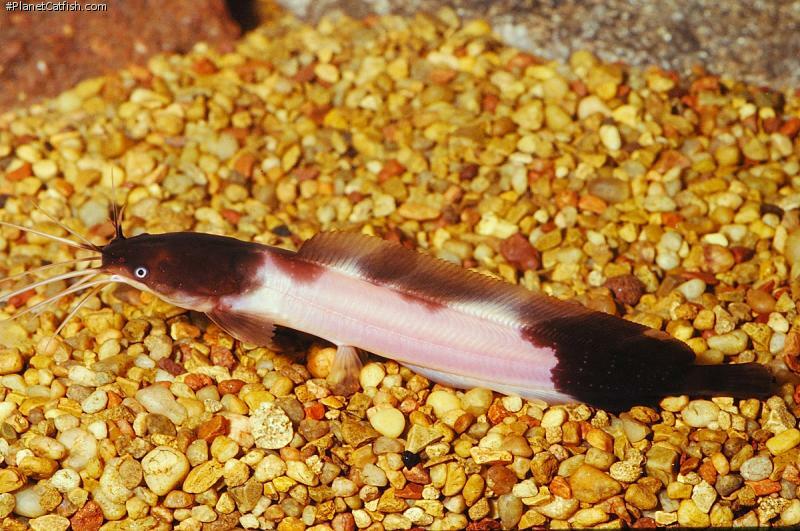 If you live in a part of the world where they are available for sale, the common walking catfish is worth a look for that "big-fish" tank." Etymology Clarias: From the Greek chlaros, meaning lively; in reference to the ability of the fish to live for long periods out of water. Shown above are the mottled or marbled colour variety and also the more commonly available pinky-white form. From time to time you also see the ''original'' brown with white belly wild form. Sexing Mature males have small spots along the dorsal fin; it is not known if this also applies to the albino colour variant. Other Parameters Unimportant, the fish will prosper in a wide range of PH and water hardness. Feeding Anything; this fish is totally omnivorous and will gorge itself on most offerings. Furniture Very well rooted plants and large structures that provide some shade. Appropriately sized clay pipes seem to provide a readily accepted, if less cosmetically pleasing, hideaway for these fish. Compatibility Keep with large robust fish; anything small enough will be eaten. These should be fast growing or introduced as semi-adults. The walking catfish grows very fast indeed and although purchased at a ''safe'' size for it's co-inhabitants, this ratio will rapidly change to the danger of the smaller fishes. Suggested Tankmates Large Cyprinids (Silver Sharks, Tinfoil or Spanner Barbs for example) or Central American Cichlids. Breeding See Shane's World article.